Left to Right: Michael Henderson, Today's Power; Dr. Jason Morrison, SAU Tech Chancellor; Matt Irving, Today's Power; Dr. Trey Berry, SAU System President; David McLeane, SAU Tech VC for Student Services; Dr. Valerie Wilson, SAU Tech VC for Academics; Gaye Manning, SAU Tech VC for Finance & Administration; Jim Golden, SAU Tech Foundation Board Member; Mark Cayce, General Manager Ouachita Electric Cooperative; Jennah Denney, Today's Power. 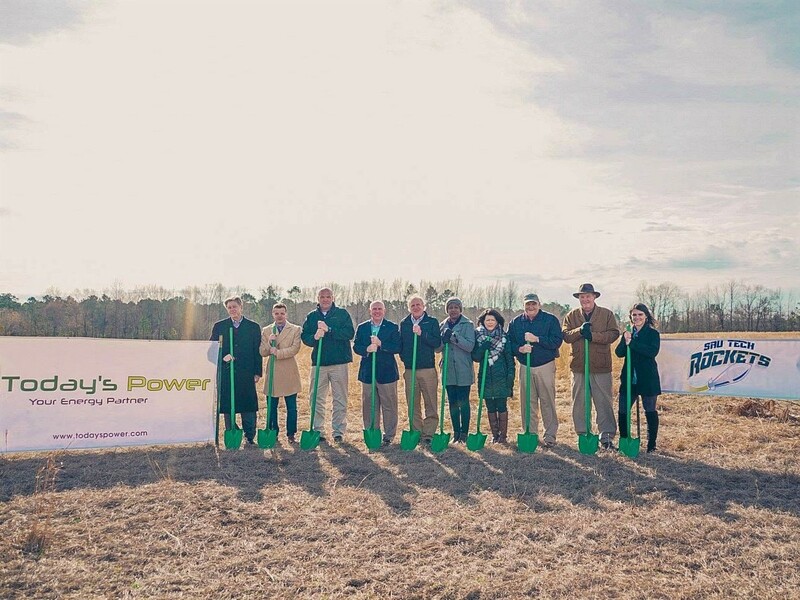 LITTLE ROCK & CAMDEN, ARKANSAS —February 08, 2019 —Southern Arkansas University Tech (SAU Tech) is collaborating with Today’s Power Inc. (TPI) to build a 1-megawatt solar facility that will provide approximately 70 percent of the College’s electrical energy needs. This 10-acre project is a single-axis tracking technology of approximately 3,344 panels will be located near Holly Springs, AR and should be sustainable for 20 to 25 years, providing a fixed price for a portion of electricity during this time span. The savings from the project will be used by SAU Tech to continue to grow the College and support its students. The plans for this project started almost a year ago as SAU Tech heard about the benefits that Ouachita Electric Cooperative was receiving from a solar system OEC installed at its headquarters. This inquiry ignited a robust collaboration over the next seven months with Ouachita Electric Cooperative, the State of Arkansas Department of Finance and Administration, local Representatives and Legislators, along with consultation from the Public Service Commission officers, to determine pathways to this groundbreaking and unique project. SAU Tech conducted a request for proposal process seeking the highest quality and lowest price offering. Today’s Power, Inc. (TPI) was selected because of its vast experience and low price. Ouachita Electric Cooperative, under the leadership of its General Manager, Mark Cayce, worked closely with SAU Tech in developing a partnership model that truly exemplifies the OECC’s mission to provide its members with affordable and reliable energy. “SAU Tech has been a key partner developing solar as an energy resource in South Arkansas since planning for the first utility-scale solar project in the state began in 2014. It was only natural the school would have a solar facility for its own use. The ability to demonstrate the economic benefits of clean renewable energy while educating young people as they begin to enter the workforce is an invaluable tool. Ouachita Electric Cooperative is proud to part of the team that is making this happen,” said Mark Cayce. This mutual commitment between the OECC and SAU Tech led to a proposal by TPI that will provide SAU Tech significant savings of approximately $105,000 annually. It also allows SAU Tech to continue to secure approximately 30 percent of its power directly from Ouachita Electric Cooperative while obtaining 70 percent of its energy needs from clean, green, and sustainable solar technology. This is the 23rd project that TPI has developed, with most in the 1 MW range, as the result of a utility partnership with Arkansas and adjoining states. ”We are so proud to have been selected to partner with SAU Tech and Ouachita Electric in developing this project. The unique ownership partnership with SAU Tech makes us partners for the next 20 years and I couldn’t think of any other institution that fits our culture so well. This project has had to overcome a lot of hurdles with educating and obtaining Arkansas Public Service Commission approval and withstanding aggressive challenges by traditional utilities who sought to prevent this Net Metering transaction structure” said Michael W. Henderson, President of TPI. SAU Tech is a publicly funded two-year college created in 1968. The College provides online, traditional, and technical degrees to around 1800 students each year. The College employs over 150 staff and faculty and is located inside the Highland Industrial Park in East Camden, Arkansas. SAU Tech is accredited by the Higher Learning Commission and provides state-wide certifications through its environmental and fire academies. In 2018, SAU Tech added Rocket athletics (Basketball) to its offerings for students and in 2019 has plans to add softball as well. The athletics program is part of the National Junior College Athletic Association.